Noel White’s new book Celebration of Life Through Story ($21.99, hardcover, 9781498497992; $12.99, paperback, 9781498497985; $6.99, eBook, 9781498498005) shares that a story has been part of human life from the very beginning. Whether it be in a speech, a sermon, or a funeral, people remember the stories that are told, thus remembering the points of the message and the person whose life is being celebrated. Abstraction and vague theological points are soon forgotten by people who are present to honor the deceased. Celebration of Life Through Story is a unique and positive approach to a subject people do not want to talk about--death. This book will help people understand grief, that God is in their story, and that our story is in God's story--even after we physically die. As a pastor for over 50 years, Noel White has led many celebration of life services, and heard other pastors do the same. Since childhood and through adulthood, he has listened and received the gospel better through the use of story. It is a tool that every speaker has but too few use. When people are asked what they remember about a speech or sermon they invariably mention the stories. White has found that stories in scripture and about a person's life are the best tool to make the celebration of life positive, remembered and comforting. Xulon Press, a division of Salem Media Group, is the world’s largest Christian self-publisher, with more than 12,000 titles published to date. 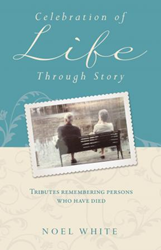 Retailers may order Celebration of Life Through Story through Ingram Book Company and/or Spring Arbor Book Distributors. The book is available online through xulonpress.com/bookstore, amazon.com, and barnesandnoble.com.